When a professor is murdered, the mummy of a black magician from the jungles of Central America—and the scroll containing the incantation to call the spirit back to the body—are stolen. When Jack Slade rescues the professor’s beautiful granddaughter from a similar fate, he must race to prevent unspeakable evil from being unleashed upon the world. 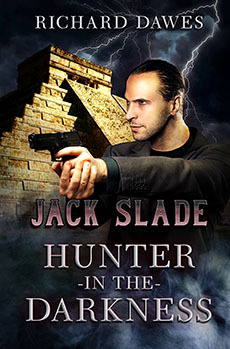 Jack Slade tooled the black Jaguar XJ through the winding mountain road, working the gear shift as he took the corners at speed. It was early autumn, and the road was almost deserted except for an occasional logging truck. He had spent the morning climbing the mountains and the afternoon crossing them. Now he was on the down side. The sun was rolling toward the west. Its long rays slanted through the pine forest, turning the needle-hung branches and the underbrush a translucent, golden-green. A quick glance at the gas gauge told him that he needed to stop soon to re-fuel. Although he hadn’t taken that route for several years, he remembered a small town about an hour’s drive ahead, carved out of the forest, catering mostly to truckers, hunters, and, during the summer, tourists who came to visit the National Forest located near-by. Considering that he had plenty of time to get where he was going, he decided that he would eat and sleep there before moving on in the morning. By the time Slade pulled into the parking lot of the Pine Grove Restaurant and Motel, the sun had set and a glittering spray of diamonds swept the purple sky. He paused beside the car to stretch his six-foot, muscular frame, and as he did so, he cast a glance up and down the single street of the town. It was about a mile long, lined with souvenir shops selling Native American artifacts, a general store, land office, cafe, a post office, pizza parlor and personal residences. A little further down the road, the electric sign of a gas station was a splash of yellow light against the solid black rampart of trees behind it. Moving with the smooth, easy grace of a panther, he crossed the deserted parking lot and mounted the stone steps to the front door of the restaurant. With his hand on the brass bar, about to open the door, he paused when he saw two signs posted on the wall to the side. They were notices with photographs of two teenage girls who had recently gone missing. Slade checked the dates and noted that one girl disappeared only a month previously. The other had failed to come home from school just two days before. Shaking his head, he pulled the door open and went inside. He paused as the door swung shut behind him and surveyed the room. The tables were almost empty, with only three couples scattered throughout, having dinner. There was a counter straight back where a few men sat eating or nursing beers. Slade turned to the left, walked to a table next to the window where no one was behind him and sat. He had a clear view of the parking lot and the restaurant. A tall blonde woman in a green uniform and a yellow apron moved from behind the counter and came toward him, a menu under one arm. Slade watched her approach, noting the liquid roll of her hips, her long legs, slender waist and up-swept breasts. Her short, curly hair was bleached, but not garishly so. Her face told him she was in her mid-thirties, with straightforward, competent good looks. As she moved away, Slade watched her rear end bunch beneath her skirt, the flex of her well-shaped calves, then returned to the menu. Their eyes met briefly as she picked up the menu, then she spun around and walked back to the counter. By the time Slade finished dinner, the restaurant had emptied out. He sat with his elbows on the table, nursing his last beer and gazing out the window at the deserted parking lot and the empty street. The beer and the food had eased his nerves, and he was enjoying the sense of peace and quiet that pervaded the town. The chef and his helper were in the back, cleaning the kitchen. Grace sat on a stool behind the counter, tallying receipts on an adding machine. Noticing Slade had finished his meal, she put down the receipts, came around the counter and brought him his check. He glanced at it and dropped a twenty and a ten over the top. As she reached for it, the posters for the two missing girls flashed across Slade’s mind. “Are these isolated incidents?” Slade asked. She pursed her lips as her eyes ranged over his black hair combed straight back, his broad shoulders, deep chest, sinewy hands with long tapering fingers. Then she gasped and leaned further across the table. “What’s that?” She pointed to the Colt .38 automatic in a holster on Slade’s belt, to the left of the buckle and angled for a cross-draw. She studied Slade for a long time. “Let me see some identification,” she said finally.